We have nothing against female filmmakers. Like the rest of the industry, we are baffled by how few women are making films nowadays compared to the far higher male ratio, and we feel that amidst all the Ava DuVernays and Kathryn Bigelows of the world there is plenty of raw female talent that has yet to be discovered, and needs to be given a chance to show what they’re made of in this industry of unfortunate chauvinism. The world wants more, the guilds want more, and we want more; what we’re saying is, we believe in equality for all genders, races etc when it comes to making the films they want to make. We wanted to make sure you knew this before we talked about writer-director Angelina Jolie-Pitt – as she apparently wants to go by now – and how terrible a filmmaker she really is. The actress and humanitarian has now made three films from behind the camera – Bosnian war drama In the Land of Blood and Honey, last year’s Oscar bait drama Unbroken, and now By The Sea – yet she continues to make the critical mistake of assuming that style also means substance, as well as emphasising how important a certain topic is without ever explaining what makes them so important to begin with. Instead, as noble as her efforts may be, her directorial style comes off as more pretentious and overbearing rather than truly respectful and engaging. 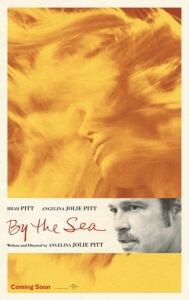 Nowhere is that made clearer enough than in By The Sea, which sees Jolie-Pitt for the first time in her directing career casting herself alongside real-life husband Brad Pitt as – big shock – a married couple, who settle in to a small French seaside resort where he, a writer, attempts to finish a book while she, a former dancer, mostly sits there being moody for reasons left only until the very end. And that’s it – that really is it in terms of story, and yet there’s two hours of running time needed to fill. So, Jolie-Pitt makes the decision to fill in the blanks with underwritten side characters, scenes that just repeat themselves over and over again, and – most excruciating of all – several shots of herself looking like she’s always on break from filming a perfume advert, even when she’s just gotten out of bed. Not only that, but there will be entire lines of dialogue dedicated to how lovely she is and how fantastic she looks, even when she’s doing the most repugnant things. Basically, after two films where she’s attempted to highlight real causes without actually going into why they’re causes to begin with, Jolie-Pitt seems to have just thrown her hands up in the air over what to highlight next and decided to write herself a vanity project, with the sole purpose of highlighting how incredibly beautiful she is to everyone around her. But it’s also a BAD vanity project, the type where the self-direction is so convoluted that she doesn’t even seem to have on-screen chemistry with her own husband (poor Brad, being sucked into this – the things we do for the ones we love, eh? ), the writing feels like it came directly out of an emo girl’s private diary pages with exactly the kind of hackneyed poetry dialogue you’d expect – when Jolie-Pitt walks back into her hotel after jumping into the sea, and is commented by how wet she looks (don’t read too much into that…), she says as blunt as a wooden plank “Now I feel on the outside as I do on the inside” – and, most punishingly of all, the pacing of a snail dragging a 16-ton weight which makes it an extremely boring film to watch, especially as it seems to repeat itself over and over and over without any real drama or reason to care about these miserable people whatsoever. As you can imagine, so far Jolie-Pitt hasn’t had a strong directorial career so far. By The Sea, arguably her worst film to date, is testament to that and also how she really needs to properly learn how to construct an actual film with proper characters, a coherent story, and a reason to actually keep watching instead of being bored senseless with how self-indulgent her style seems to be. Perhaps she needs to take advice from another director, Mike Leigh, but not in the way you’re probably thinking. There’s a great roundtable interview with several directors during last year’s Oscar race, with both Jolie-Pitt and Leigh among them, and they’re all discussing what makes their particular film stand out. When it gets to Jolie-Pitt, who’s already feeling out of her league, she keeps going on about how important the life of the man she’s representing in Unbroken is, how fantastic and inspiring it should be to audiences who aren’t familiar with him, and basically just rambling on about what a great cause it is that needs more attention. That moment in the roundtable interview – which you can watch here – should also be a crucial leaning crux if Jolie-Pitt wants to evolve as a director; instead of focusing more on the importance of the topic (or, in By The Sea’s case, non-importance), she should instead think about being an actual director. Because right now, and we feel bad saying this when there are far too few female directors out there, she’s not impressing us so far. By The Sea is a pure vanity project for writer-director-star Angelina Jolie-Pitt, but one that’s done so poorly with such bothersome writing and directing that it makes us question her real attention-grabbing ambitions in filmmaking.